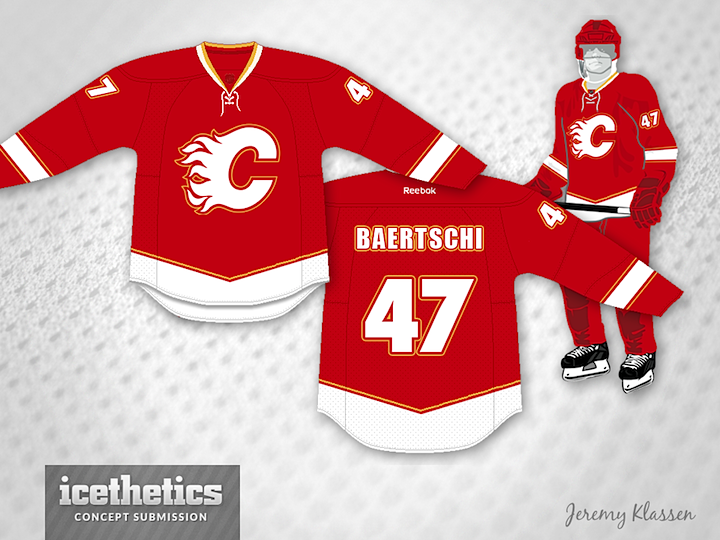 A few months ago when I heard the Calgary Flames were going to be introducing a new third jersey, I decided to take a crack at designing one. Now, I am by no means a professional designer, but working in post-production you often have to do some design work so I thought it would be fun to take a crack a jersey.. I mocked something up and sent it along to Icethetics, the awesome hockey jersey design blog, and didn't think much of it. Somehow I missed when it was posted back at the beginning of October, but was happy to see it was met with some very nice comments. The general idea with these was to merge the two fan-favourtie designs; that of the 1980's home jersey and that of the 2004 Stanley Cup run. The most interesting part of the concept for me was the logo. By changing the colour pattern, the contrast gives the logo a nice sharpness while retaining the retro colouring scheme. I've never been a huge fan of the yellow in the jersey, so I limited it to an accent, rather than a primary colour. Big thanks to Icethetics for posting my concept, and to everyone who left a comment. I am glad it got some positive feedback!